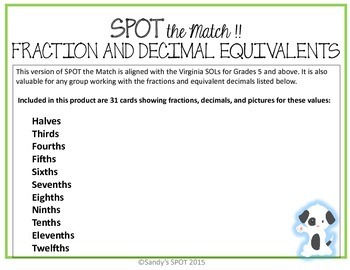 Includes halves, fourths, fifths, eighths, tenths, and twelfths. Thirds and sixths are included with equivalent twelfths. Also includes cards with equivalents for ninths and one-eleventh and six elevenths. 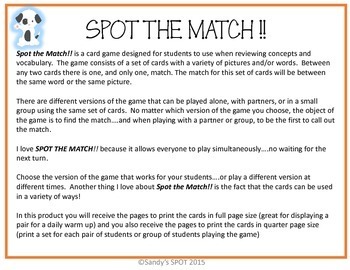 If you are working on identifying FRACTION and DECIMAL EQUIVALENTS , this Spot the Match activity is a great resource. 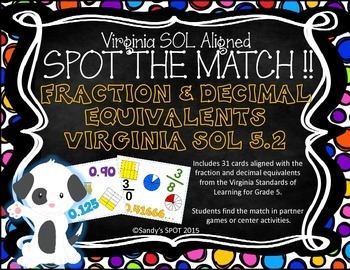 This is a great back-to-school review for grade 6 and also a great review for Grade 5.